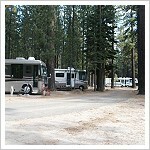 Tahoe Valley Campground is a nice park with a wonderful ambiance among the tall trees of this scenic valley. The park is located right in town and close to all the casinos, yet it’s tucked away and back in among trees, so you really feel like you are in the boonies. The staff was wonderful, very friendly and accomodating… they didn’t know the meaning of the word “no”. One nice touch when we checked in: a member of the staff will drive you around to select your site in a golf cart! Tahoe Valley Campground had a good variety of amenities including a playground area, pool, basketball court, ping pong and video arcade. There’s shopping nearby too! Great atmosphere. Will be back again and recommend this park to our friends. I recommend that you don’t go there. This used to be a good park, but in the summer of 2012 they started church group camp outs. I mean 1,000 people. They put travel trailers in tent sites. People walk thru your site, the kids play hide and seek around your RV, but worse of all they use the beautiful forest for a parking lot and dirt road to leave after meetings which were 2 times a day. There was so much dust flying around in our campground. We stay for a month and it’s not cheap, $1,400.00 a month. It’s so sad. They are ruining the forest all for money. Just for the record, we have been coming here for the last 5 years and it was a good park. August 2007 – We also had a great experience at this campground. The grounds have a ton of land to explore on bikes. The staff is friendly and the rates are reasonable. The arcade is a little run down, but it will keep young ones entertained for awhile. The spots are dirt, but the hookups are easily accessed. They could use more playground equipment, but the pool, basketball court and tennis court were nice. We will return to this campground in the future. I totally agree! This is one of the best sites I\’ve stayed in. It was clean, friendly and down to earth! VERY family friendly! Old fasion events like Family style movies (G and PG rated movies) on Saturday night in their big tent. We felt safe letting our kids play in the playground and roaming the park without having to watch them every minute. Very Dog friendly as well. While we were there, they had a Dog Show for campers pets.